The LCA (Landing Craft Assault) was the basic landing craft of the Second World War and was derived from a design by John I. Thorneycroft Ltd. of Woolston, Hampshire, UK. During the war it was manufactured throughout the United Kingdom in small boatyards and by furniture manufacturers. Designed to transport 30 to 35 fully-equipped soldiers it featured a flat-bottomed hull and was made of plywood with strategically-placed armoured plate to provide a measure of protection to the troops during run-ups to the beach. The design and subsequent weight limited the LCA to less than 8 knots even though powered by two 65hp Ford V8 engines. Armament of the 12.5m long LCA consisted of one .30 calibre (12,7 mm) machine gun and two Lewis (.303 calibre) machine guns. Prior to July 1942, these craft were referred to as “Assault Landing Craft” (ALC) and the craft were marked with this designation. 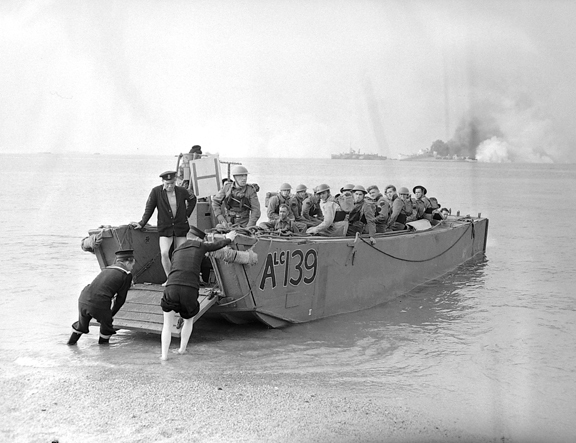 After that date, “Landing Craft, Assault” (LCA) was used to conform to the Allied naming standards. Almost 50,000 seaman and officers, mostly from the Royal Naval Patrol Service, and the Royal Navy Volunteer Reserve (RNVR) crewed the landing craft, of all types. Of these, the Royal Canadian Navy provided 60 officers and 300 ratings, on the condition that they be formed into specifically Canadian companies. 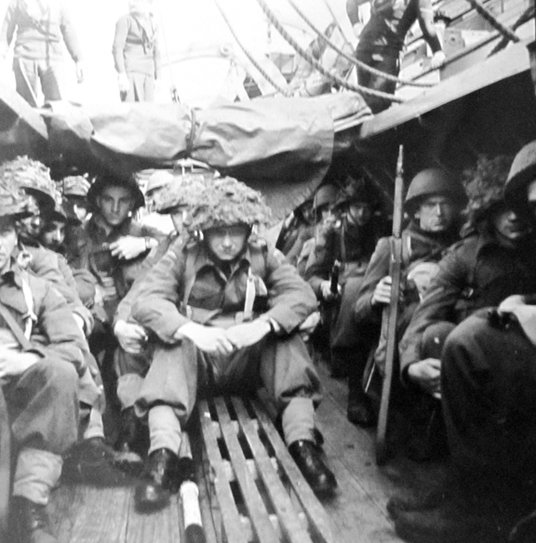 During Operation Jubilee (the Dieppe raid of 19 August 1942) sixty LCAs were employed to carry the assault infantry of the 2nd Canadian Infantry Division, ‘A Commando’ Royal Marines, and No. 4 Commando. Until Dieppe, LCAs had only been used in small numbers. Infantrymen of Le Regiment de la Chaudiere alongside HMCS Prince David, off the coast of England, 9 May 1944. An indication of the cramped quarters that were an LCA. 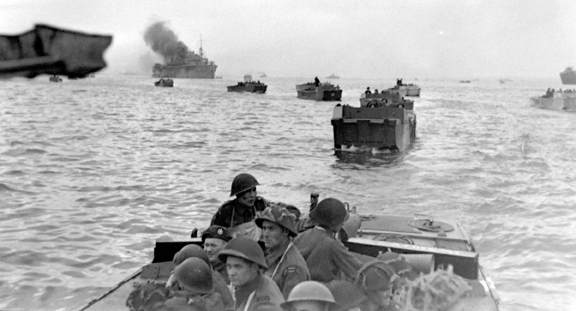 Here, Canadian troops take part in Exercise Fabious, 15 May 1944. The Sicily Landings (Operation Husky, the invasion of Sicily in July 1943) was the first direct assault on the defended territory of an Axis homeland, and the most complex combined operations expedition yet. All together, 94 LCAs were employed in six of the seven landing areas. In addition, new craft and vehicles were used on some beaches in preference to LCAs. 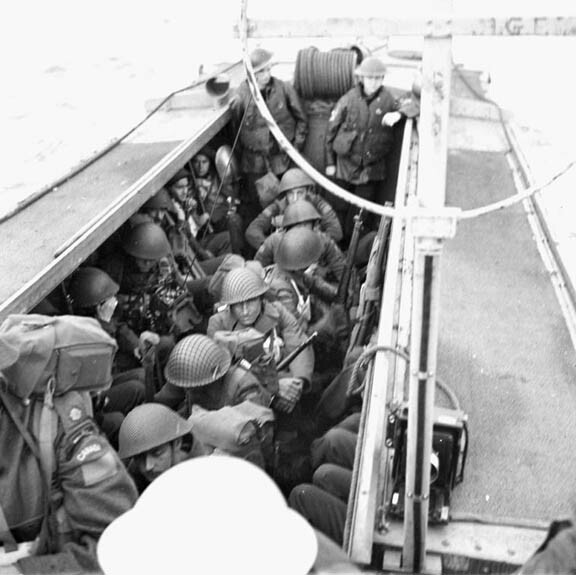 LCAs, along with many other types of landing craft, were employed on D-Day to land troops of the 3rd Canadian Infantry Division ashore at Juno Beach. Royal Winnipeg Rifles running up to the beach on D-Day.